How Long Can You Shower in an RV For? One thing which bothers many people before they take their first RV trip is the shower. 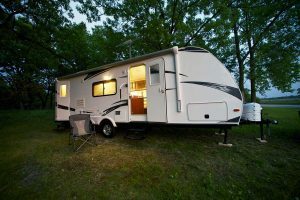 Would you be able to take a long leisurely hot shower like you do at home, or do RV’s have limitations on shower time? Longtime boondocking: 2-3 minutes per shower is advised. Hooked up but no tankless water tank: 5-10 minute long shower time is reasonable. In campground with full hook-ups, a tankless water heater and open grey water valve – infinite shower time! This post will explain everything about what showering in an RV is like – including the basics of the water system, heating and grey water dumping – so you can see what determines the length of a shower. Read through for tons of useful tips that will help you make your RV showers longer! So, why are we even talking about shower time in the RV? How much water you have available – if using the freshwater tank. The amount of available hot water – if you have a dedicated hot water tank. How do you dispose of used water. I’m going to explain how these systems work in an RV and show you the tips and tricks that will help you make the most of them – or from the alternative water supply. So, how do RV showers work? Water from the freshwater tank. Let’s start with your setup if you using the freshwater tank. Most RV freshwater tanks are roughly 50 gallons, but the size can vary from one rig to another. All the water that comes out of here is potable, so it can be used for cooking and drinking as well as for showering. It’s also the same water that’s in your toilet and faucets. When in a campground with full hookups, you may rely on a city water connection. As the name suggests, this is an outside source of water that doesn’t come from your vehicle. You’ll need a pressure adapter in the hose line when you use a hookup to prevent excess pressure from bursting the pipes. Also, only open the valve partially with a city water connection, about halfway. This keeps the hose in place and allows air to pass through. Again, that reduces the chance that your pipes will explode. Where does the water go to after use? When you use the water for toilet purposes, it then moves to a blackwater holding tank. If you use it for showering and other sanitary use, it goes to the gray water holding tank instead. Each tank may be up to 40 gallons. When in a campground with full hookups, you can connect your grey water to the sewage outlet. If you then keep the valve open, your grey water will constantly flow out so you will never fill up the grey water tank. Which means your shower time can be as long as you want it to be – although realistically, unless you’re a human form of fish, you’re unlikely to take a shower long enough to fill up an empty grey water tank. Many RV’ers prefer to keep the grey water tank valve closed, claiming sewage odors can back up via the pipe and invade the space of the RV. A good compromise would be to make sure you dumped all of your grey water before taking a super long shower. There’s often virtually unlimited water at your disposal, and you won’t be restricted on cooler or colder water. If it’s a hot summer day and you’re looking forward to cooling off in your RV shower, you can wash off for as long as you need. If it’s any other time of the year than summer, then admittedly a cold shower might not suffice. That’s why tankless water heaters exist. This one from Girard Prod is a favorite for RV owners. It runs on 12 volts, includes a brushless motor that makes less noise, and provides 42,000 BTUs of warmth. You don’t even need extra plumbing fixtures or LP gas lines to hook it up. It’s quick, convenient, and will save your showers. No tankless water heater? So, you’re using your hot water tank. Which is smaller. The problem is – as soon as you take water out of it – to run the shower – cold water begins to come in. The colder the water from the source – the sooner you’ll run out of water that’s hot enough to use for a refreshing shower. If you’re using water from the campground, you could use the following trick to extend your hot shower time: Switch from using the city water supply hook up to your freshwater tank (which you filled at least a day prior). In most cases, the water coming in through the hookups will be very cold, as they’re coming from the ground. By using water from the freshwater tank, you’re combining warmer water with the hot water from your heater, which generally makes for a hotter shower. Since you’re not sourcing water from the often-freezing campsite water wells, you get hotter water for longer. So, now you know the limit of your water tank supply – or the infinite source of hookups. You also know that you should get a tankless water heater if you don’t already have one. Another handy tip you might not have thought of is it to change your shower head. Yes, your shower head. The Orbit from Ecocamel is a favorite. A water-saving shower head like this will make your RV showering experience vastly longer. You’ll get a more consistent and strong spray thanks to the bicycle spoke patterned rubber nodules. This shower head also boasts the shape of a halo so it’s more encompassing. High-pressure shower heads are good for more than just longer, warmer showers. They’re also easily cleaned, thus reducing the chance of getting an infection from bacteria. Considering that most shower heads are overrun with bacteria, this is a good thing. You’ll also find the Orbit shower head cleans more efficiently and even provides a gentle massaging sensation that can relieve aching muscles. How Do I Shower at a Campground? If you’re planning a weekend at a campground, you’ll more than likely have to make use of freshwater hookups onsite. If you don’t have a tankless heater or your hot water tank isn’t large enough – you can often still enjoy a long hot shower by using the campgrounds facilities. Most campgrounds offer showers for people who camp in a tent or a pop-up camper and no one is stopping you from using them. Some places – especially national parks – require a small additional payment. The last campground shower I tried was in one of the campgrounds in Sequoia and Kings National Park in California. A token cost around one dollar and provided six minutes of a super strong water jet that I could adjust to be as hot as I wanted to. That’s plenty of time to enjoy a long shower, including washing your hair. Having said that – you probably prefer the comfort and privacy of your own RV shower – after all, that’s why you have an RV, right? With that in mind, it’s time to talk about the most challenging setup – boondocking, or camping with no hookups. 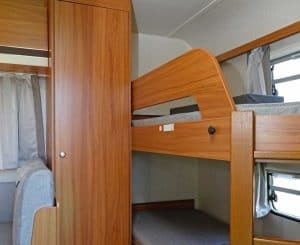 To truly get away from the hustle and bustle of daily life, you may decide to go dry camping, also known as boondocking. With this type of camping, you will definitely not have access to any water hookups. Boondocking also means you’re not spending the night as a campground, so no public showers available. Unless you’re planning on stopping in a trucker’s rest area with showers – often a viable option – you need to make do with your RV’s tanks. You will have to gauge how full your freshwater and hot water holding tanks are before you step into the bathroom. Most RVs have a device built into the wall for monitoring all your tanks, which you can see in action in the video we linked to above in this article. As you surely know by now, the smaller your tanks are, the less water you’ll get for a shower. You should also remember that the freshwater tank is used for more than just showering. Make sure you have a decent water supply for other activities, such as drinking, cooking, and using the faucet and toilet. You should keep a jerrycan of water onboard your vehicle if you can fit it. That alone could give you some bonus shower time over the course of several days of dry camping. Learn to love navy showers. Sometimes called staggered showers, a navy shower takes about a minute and a half of running water. You get yourself wet with water in the first 30 seconds, then shut the water off. Next, you wash your hair and your body, then turn the water back on. Over the next minute, you can clean yourself off. Then you’re done! Dry shampoo can extend the length of your “do without washing” time. Just spray this in your hair when it starts to get grungy and it will restore shine and softness. If you’re the type who spends most of your shower time washing your mane, this will help. Cut back on washing your hands with good ol’ soap and water. Hand sanitizer is a great alternative. It doesn’t kill as many germs as washing your hands traditionally does, which is worth noting. If you are relying on this method, then make sure it isn’t cold or flu season. What does taking a shower in an RV feels like? Finally, if you’re reading this, you probably have no experience with RV showers and you might be wondering what showering in an RV even feels like. So, I’ll expand on that for a few. Clearly, that would depend on the size of the RV. In an average motorhome or travel trailer the shower pan is usually about 32-34 inches wide which is just the same as a home shower. In a home shower, the length of a shower base is usually around 60″ – that’s the case in some RVs but not all. Many smaller units have a corner shower base which measures around 34″ in both width and length. In the clip, the RV owners said they only had a six-gallon water heater, yet they waited just five minutes from one shower to another. The best part? Both the husband and wife had hot water. If you thought you would freeze or have an uncomfortable experience while showering in your RV, this video is a real eye-opener. It shows that showering is a lot like what you’re used to back home! 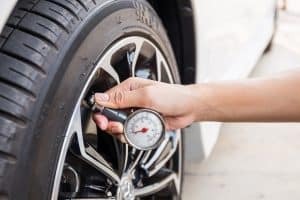 What Should the Tire Pressure Be On an RV?